(This is the section that explains the detail of the operation or procedure above and should be read in conjunction with the section Your Back Operation). Sometimes it is necessary to perform a lumbar spinal fusion. This is done to create a bony union between two or more lumbar vertebrae, in order to stabilise the spine. It is usually done for instability which may arise from an injury or from wear and tear changes. It may also be secondary to extensive decompressive surgery or may be made necessary by a gradual dislocation from an inborn abnormality. Other causes are infection, tumour or a previous fusion that has failed to unite. A spinal fusion operation is also sometimes performed following lumbar disc removal, nerve decompression, removal of vertebral bodies or for the correction of spinal deformity. In order to improve the chances of successful bony union, internal supports and pedicle screws are often used (see the section Anatomy of the Spine). Internal devices may consist of blocks of bone, plastic or metal, which are introduced between the vertebrae. Instrumentation consists usually of pedicle screws with rigid linkages. These pedicle screws pass through the pedicles of the vertebrae and achieve a strong hold on the vertebrae. They are then inter-connected with a rod. These drawings illustrate the different bony openings that are created during two different interbody fusion procedures. The left-hand picture demonstrates the partial removal of the laminae on both sides. This approach, or bony opening, is used in a PLIF (posterior lumbar interbody fusion). The drawing on the right demonstrates the approach for a TLIF (transforaminal lumbar interbody fusion). Note how, in this case, the facet joint on the left has been removed. Both the lamina and the joint are removed to get to the foramen through which the nerve runs. 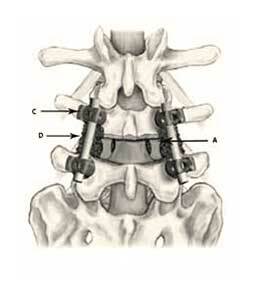 In both cases as much as possible of the disc is removed and replaced by spacers that are filled with bone. It has two functions, the first is to carry the weight transmitted through the spine and the second function is to allow the two vertebrae to grow together (fuse). The proper fusion is achieved through bone growth. 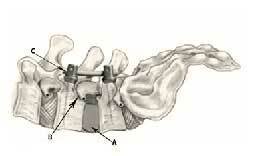 The bone is placed between and around certain segments of the adjacent vertebrae, which then grow together. These may be the spinous processes of the vertebrae (interspinous fusion), the laminae of the vertebrae (posterior fusion), the transverse processes (inter-transverse postero-lateral fusion) or between the vertebral bodies themselves (interbody fusion). Of these techniques the inter-transverse postero-lateral fusion and the interbody fusion are the most common forms of posterior fusions performed. Many of the interspinous devices do not constitute a proper fusion as the aim is not bony growth, but rather to keep the distance between the spinous processes and allow for the spinal canal to be capacious, thus reducing nerve compression due to a narrowing of the canal. The interbody fusions are divided according to the method of introducing the bone between the vertebral bodies into posterior lumbar interbody fusion (PLIF) and transforaminal lumbar interbody fusion (TLIF). The traditional posterior lumbar interbody fusion (PLIF) places bone blocks or cages between the vertebrae from both sides, which necessitates operating from both sides of the spinal canal. The more recent operation of a TLIF places a single spacer well forward between the vertebrae and this is introduced from one side only. 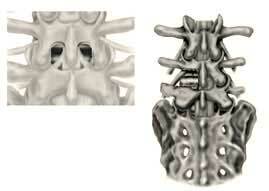 In both cases the remaining space between the vertebrae is then filled with bone. These operations often need bone to be harvested from the iliac crest (the hip) of the patient through usually a separate incision, because at this stage the use of the patient's own bone for fusion is still regarded as the gold standard. Sometimes the decompression operation yields enough excised bone that can be collected and prepared to be used for the bone graft. Allograft from a bone bank or synthetic material (inducing bone growth) is also used by some specialists for this purpose. The main aim of the fusion operation is to achieve bony fusion. If this is not achieved, then the operation has failed and if the patient continues to have symptoms, another operation might have to be performed in the future. Bone growth is variable and depends on many factors. These vary from person to person. These drawings illustrate a PLIF. Note how the cages (A) have been placed in the cleared disc space. The picture above demonstrates what it looks like if you could see the spine close-up from the side and the picture on the left demonstrates what it looks like from the specialist’s perspective. One can appreciate how close to the nerves (B) these cages are placed. Pedicle screws (C) interconnected with rods are added to strengthen the construct and keep the segment from moving until the fusion grows. Bone (D) is packed over the sides of the vertebrae to enhance fusion. It is usually assumed that bone growth takes place from six weeks onward and significant bone growth usually only occurs within three to six months. If it takes longer than a year, then it is called a delayed union and if it takes longer than two years one must assume that the fusion is unlikely to unite. There are a variety of pedicle screw systems and spacer systems available and they are usually detailed in the web pages of the manufacturer. You may want to ask your specialist about the name of the spacer or the pedicle screws that are likely to be used for this purpose. The implants do not constitute a fusion by themselves, because they contain no bone, which always has to be added. The instrumentation purely constitutes a mechanical device which allows fusion to take place in a higher percentage of patients, while at the same time the vertebrae are held in the best position for healing and function of the lumbar spine. The operation is performed from the back, through an incision over the lumbar spine, which is slowly deepened to expose the posterior aspects of the lumbar spine. Occasionally no decompression of the nerves or approach to the disc area is necessary, in which case the fusion can be done between the transverse processes, the laminae or the spinous processes. If decompression of the nerves are required, removal of damaged disc or even more extensive removal of the spinous processes and laminae may be needed. In this case the nerves and the spinous dural sleeve (the membrane that contains the nerves) will form part of the operating field. In these cases the bone transplant has to be placed on and in-between the transverse processes on the side of the spinal canal. The approach from the back is also necessary for the posterior lumbar interbody fusion and for the transforaminal interbody fusion. In the case of a transforaminal interbody fusion, the disc space is accessed from the space available on the outer side of the nerve roots and dural sleeve, underneath the facet joint on that side. Careful attention is paid to obtaining good control of all bleeding points before the wound is closed along the tissue layers. The laminae and spinous processes are not replaced if they have been removed. The initial phase of the post-operative care consists mainly of managing the post-operative pain and of early detection of complications. Usually you would be expected to get out of bed on the first or second day after surgery. You may usually walk around as much as you want depending on the stability of your spine. Your specialist will advise you about this. You should avoid sitting for too long or on too low a seat, because this may cause strain on the back and result in pain. Your specialist may recommend a period of time during which you should refrain from sitting. Your specialist also may or may not require you to wear a brace until the bony growth has advanced to the stage where the brace can be discarded. You would normally be discharged at about five to ten days after surgery, depending on the degree of pain and disability you are experiencing and on the absence of any complicating wound factors or concern about your general health at the time. The hospital staff will assist you in obtaining your follow-up consultation bookings, the prescribed analgesics to take home, the sick leave-certificate to be provided by your doctor and the instructions regarding wound care provisions in the post-operative period. It is important that you gradually become more active and mobile and that you follow an exercise programme. Your return to work should depend on a realistic assessment of your ability to perform your work. After a spinal fusion, it would usually be after two to three months, depending on the type of work you do and the circumstances under which you perform your work. It is important to follow the exercise programme according to the guidelines laid down by your physiotherapist and later by your biokineticist. You should refrain from exercises that involve impact until you are much more comfortable. Jogging, mountain biking and equestrian pursuits usually have to be delayed for some months. You will generally be seen by your specialist between two and six weeks following surgery, but you may be seen earlier if there are any complications. The spinal fusion would ordinarily be examined by means of an X-ray of your back a few months after the operation, to evaluate the bone growth between the two vertebrae. It is important to realise that you will have to protect your back for the rest of your life and apply good back habits (see the section Caring for your Spine).